Farmer’s Market Watercolor Painting | What's Jenny Making? I love the farmer’s market. First of all, I love fruits and vegetables and do not have to be asked or shamed into eating a majority of my foods as or with fruits or vegetables. They have so much flavor! Secondly, I love the colors of the Farmer’s Market. Brilliant colors right next to each other — strawberries next to eggplant or oranges or lettuce or what-have-you. The farmer’s market is so visually appealing to me. I’ve been thinking I want to paint some sort of farmer’s market image…maybe even go to my local farmer’s market (maybe) and set up and draw there for a bit and experiment with the color. I had no action on my part toward this until I saw an advertisement for the Call for Submissions for the Multifaith Calendar. I first came into contact with the Multifaith Calendar in my work as a chaplain. The calendar displays original artwork having to do with faith and displays also the major holidays from 14 major faith traditions throughout the world. It is very interesting and usually very beautiful. Themes are really hard for me and always have been. Even more-so if I am on a deadline (which I was…I started thinking about this on…let’s say December 15th and had to send in my entry by December 31st). Throw in a bunch of work and social engagements in that time and it’s enough to make me thankful that I was able to paint anything at all! So, I thought and I thought. The Multifaith Calendar, in my experience, shies away from blatantly religious paintings (that hit at only one of the faiths). Understandably so, since they are trying to have different religious traditions connect with each other. Many of my religious-themed artworks would not fit with their style. I have some loosely religious works in my arsenal, but I’d need to submit a high-quality scan if chosen, and the one I thought might work is in the possession of a friend in New Jersey, who fell in love with and purchased the painting. So that was out. I started thinking about their prompt about ways we feel at peace and feel connected. And I have to say that, although going to the farmer’s market is not really a religious experience for me, per se, it is one that makes me feel connected. Connected to the community, connected to the people who grow the food I eat. So, I started thinking that I should take the idea of painting a scene from the Farmer’s Market for this project. I also thought of my love for stained glass, but not only for the glass itself, but for the reflection it leaves on the walls and floor when the light shines through. But, I didn’t have enough time to work out that vision. I also didn’t have enough time to go to my own farmer’s market. And, it being the dead of winter, there’s not that many exciting things there (although, certainly, more exciting things than I imagine is available in the rest of the country at the moment). So, I looked online and found a picture of a farmer’s market scene and decided to paint that. And, here’s the finished, submitted piece. I think you can probably click to make it larger, or you can click through to where it’s listed on my website. I am happy with how it came out, but I also think it could use some more work. So, maybe farmer’s market scenes are in my future — I feel like I still have a lot to learn from them. For instance, how do you paint a swath of color and, on the one hand, indicate that there are a bunch of fruits or vegetables in that color plane, but on the other hand, not draw out every vegetable? That is a challenge that I haven’t solved just yet. And people — people need to be in the composition. But I am just so bad at drawing and painting people. So–lots to learn and experiment with. 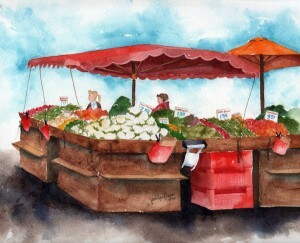 This entry was posted in art, contest, farmers market, multifaith calendar, painting, watercolor. Bookmark the permalink. I love the fresh bright colors in this piece. And I am extra intrigued by the umbrellas for some reason I can’t explain. Nicely done. so cool. I wish you would do a picture of our church. You probably charge like a million dollars an hour right?